Freshly baked with wholesome ingredients. Free from preservatives, artificial colors or flavors. Mrs. Laura's Herbal Shortbread Collection in a variety of flavors for $9.99. Flavors include: Lemon Balm, Sugar & Spiced, Earl Grey Tea, Mint Chocolate Dipped, Nutmeg Logs, and Matcha Green Tea & White Chocolate. Collection comes with 16-18 shortbread in 4 different flavors. Call us at (336) 998-1315 to order. Orders may be picked up at our location, delivered locally, or shipped upon request. These wonderful rolls are baked fresh daily and sold locally. They are made the old fashioned way, artisan style, and with high quality ingredients. Making them from scratch allows you to really taste the freshness and wholesome goodness in each roll. We love using herbs and spices as much as possible and most of our flavors are designed around fresh herbs or spices, paired with other flavors that really accent them nicely. 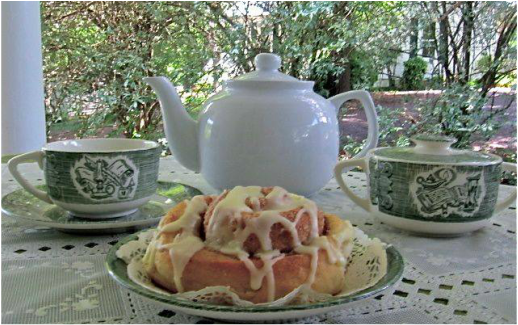 We offer a wholesale listing of products for local businesses with items such as our popular cinnamon rolls, herbal shortbread, danish, muffins, and more. Classic Cinnamon A warm cinnamon flavor rolled up in fresh dough and topped with vanilla icing.These rolls area great for a breakfast treat. Orang﻿e Clove These rolls have a delicious clove spice inside and topped with a wonderful orange icing. A flavor partnership that your taste buds will approve of. Chocolate Covered Cherry Who can resist chocolate covered cherries? We use chopped maraschino cherries inside these tasteful buns and top them with chocolate icing. Lemon Poppy Seed This is a great summer flavor that would compliment a cool glass of lemonade or iced tea and would be great any time of day. Try our Low-Sugar Cinnamon Rolls. These are great for those who are watching their sugar intake. These rolls are so delicious, you'll never miss the sugar. 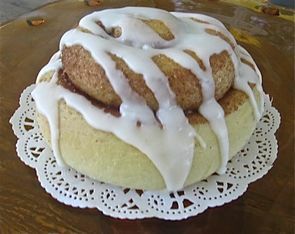 We substitute most of the sugar with Stevia, a 0 calorie natural sweetener (we do leave in some sugar for a lite icing). These rolls have 15 grams of sugar per roll compared to 39 grams in our standard Classic Cinnamon Roll. Our Low-Sugar Rolls are available in any of the above flavors. Our mini roll tray is perfect for family gatherings, parties, meetings and for sharing around the office. They come with approx. 30 mini rolls. You can order the whole batch in one flavor or divide it up between two flavors. Your batch of mini rolls will come on a covered tray, suitable for your refreshment table and your guest will love their artisan quality and flavor. Try our Herbal Mix to add to your favorite butter, cream cheese, or salad dressing to add flavor to your yeast rolls, crackers, cooked vegetables or salad. Each package cost only $3.00 and it will make up to 4 cups of herbal butter. We sell our rolls in batches (1/2 Dozen, Full Dozen or tray of mini rolls). Additional $1.00 to top with walnuts. We also offer Buttery Yeast Rolls and Harvest Yeast Rolls for $19.99 per batch (approx. 20). Our Buttery Yeast Rolls are wonderfully soft and delicious and go great with any meal. If you enjoy the hearty flavor of whole wheat, you may enjoy our Harvest Yeast Rolls, made with quality whole wheat flour. To pre-order a special batch, please call (336) 998-1315 or email- herbalaccents@yahoo.com. Hand-made from scratch and baked just for you. Available for pick-up or rolls may be delivered free if delivered within a 5 mile radius. A delivery fee of $5.00 will be charged if beyond the 5 miles. We except cash or checks to: Herbal Accents. 1842 Farmington Rd, Mocksville, NC 27028. The Factory Coffeehouse in Downtown Mocksville, NC.